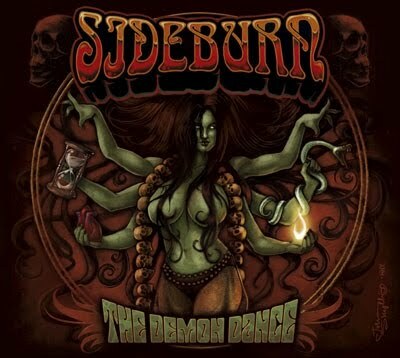 Sideburn - "The Demon Dance"
This is Sideburn's third CD and the band has had quite an evolution from the first record. I never did hear their second one on Buzzville. This record they started recording in January 2008, so it has been a long journey for this record. The CD starts off with a short doomy intro before heading into Wings of Sorrow, a heavy groovy stoner track with Hammond and it reminds me of the Spiritual Beggars a lot. Song for Hope slows things down a bit with a more muscular guitar riff and melodic vocal and a special middle part with acoustic guitars, hand drums and keyboards. Powerful vocals on this track. The end part the guitar riff gets more heavy, nasty and twisted as they launch into new territory. Great song. Fallen Sun starts off like an old Scorpions song from the 70s but then the guitar is too modern and metallic when the main riff kicks in. The guitar solo section features acoustic guitars and floating keyboards in order to change your emotional state. The riff becomes very heavy at the end. Dyi'n Day brings a more doomy and slow riff back and then they follow this with a more stoner groove, and again this one reminds me of Spiritual Beggars. On Shining the band briefly turn to a bluesy sound. The band shows a lot of good variety on this record. The title track is next and brings back the Hammond and a darker sound again. I really like the short spacey mid section before the monster heavy guitar riff takes over again and he plays a very intense guitar solo. Rainy Days is the longest track on the CD at over 7 minutes. The track starts as an acoustic ballad with just guitar and vocals. The drums start to come in slowly around 3 minutes. An Spanish-flamnico style track begins to evolve out of the acoustic section and that was not at all expected and really makes the track stand out from the rest. Remarkable song. Hold Me In Your Light is a bit more of a headbanger and classic heavy metal song for most of the track except the cool chorus section which features some Hammond. The CD ends with Shapes, which is yet another song with many different faces to it. A very strong release by Sideburn.